With its contemporary design and innovative technology, the Russell Hobbs 20460 Buckingham kettle in stainless steel is stylish and convenient. Its 1.7L capacity is perfect for a family, making up to six cups of boiling water at once. 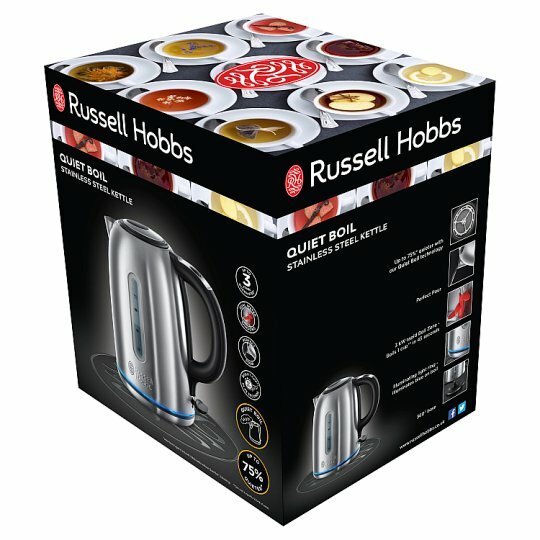 The quiet-boil feature makes this Russell Hobbs kettle up to 75 per cent quieter than a standard kettle. A powerful 3kW output can boil a single cup of water in just 45 seconds for great time efficiency with this rapid-boil kettle. With a removable, washable filter and concealed heating element, cleaning this stainless-steel kettle is easy. The water-level indicator allows you to measure water accurately and an illuminated blue ring lights up when the kettle is switched on. Its ‘perfect-pour' spout works to prevent spillages, keeping kitchen worktops clean. The 360-degree swivel base is convenient for both right- and left-handed users and incorporates cord storage so the electric kettle will look neat when not in use. Matching toaster also available.